THREE BEDROOM SEMI DETACHED PROPERTY SITUATED ON A LARGE CORNER PLOT !!! HOME ESTATE AGENTS are privalleged to bring to the market this well presented family home with scope to extended. In brief the property comprises of, porch, hallway, bay fronted lounge, dining room, kitchen, and large utility room, to the first floor there are Three well proportioned bedrooms and a family bathroom’ to the front of the property is a walled garden which leads down the side and opens out on to a large corner garden with garage and access to the rear. The property benefits from gas central heating and is partially UPVC double glazed. Situated at the head of a quite cul-de-sac with excellent local transport links including the metrolink, M60 motorway network and just a short commute to Manchester City Centre, Media City §and Salford Quays. Stretford also benefits from good schools and local ammenaties. 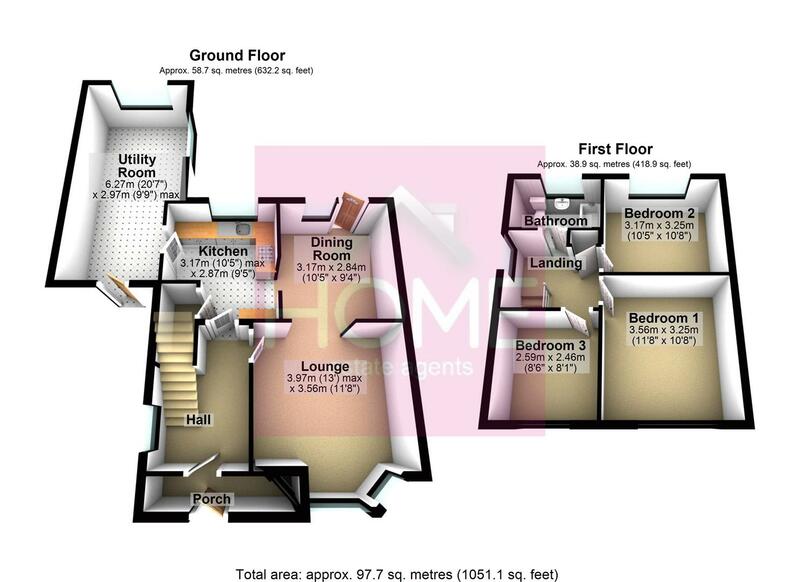 To arrange a viewing call HOME on 01618713939. UPVC double glazed front door leading in, stairs to first floor, laminate floor and single panel radiator. UPVC double glazed bay window to the front elevation, electric fire, laminate floor, ceiling coving and single panel radiator. UPVC double glazed window and door to the rear elevation, laminate floor and single panel radiator. UPVC double glazed window to the rear elevation, selection of high gloss wall and base units fitted with square edge work surfaces incorporating a stainless steel sink with mixer tap, built in single oven and microwave, halogen hob and extractor hood. laminate floor, tiled splash backs and storage pantry with combination boiler. Wood door and windows to front and rear elevation. Wood window to side elevation, storage cupboard and loft access. UPVC double glazed window to the front elevation, fitted sliding wardrobes and single panel radiator. UPVC double glazed window to the front elevation, built in wardrobe and single panel radiator. UPVC double glazed window to the rear elevation, three piec fitted bathroom suite comprising of, bath with shower, sink with pedestal, low level w/c, tiled to compliment and single panel radiator. To the front of the property is a walled garden with paved path leading down the side to a fenced area, further to the rear is a large mainly lawned garden with decking area and detached garage.